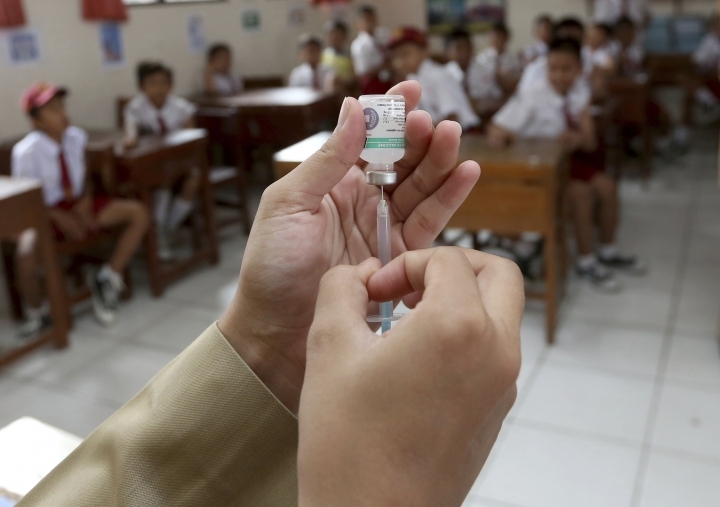 JAKARTA, Indonesia — Indonesia is immunizing millions of children and teenagers against diphtheria after the disease killed 38 people, mostly children, since January. Children in school uniforms and toddlers clinging to their parents received shots at a high school in Indonesia's capital, Jakarta, on the first day of the campaign Monday. Diphtheria is a bacterial disease that can cause breathing difficulties, heart failure and paralysis. It was more or less eradicated in Indonesia in the 1990s but health officials say it has re-emerged in the past four years because immunization rates have dropped, partly reflecting fears about vaccines. 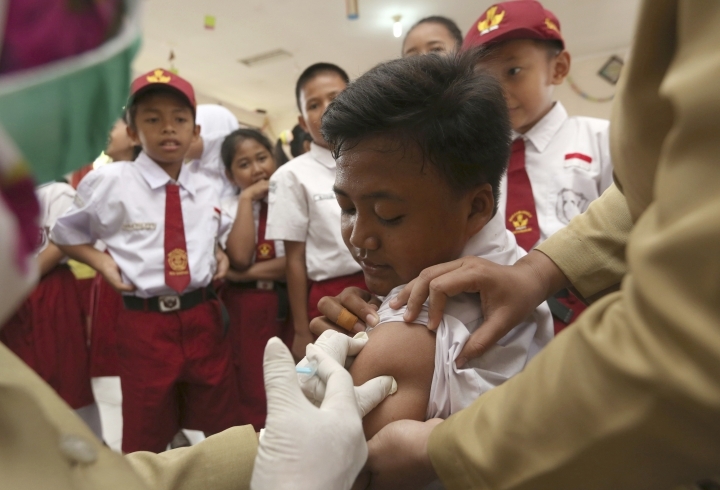 The first stage of the $112 million campaign aims to vaccinate 8 million people under the age of 19 in Jakarta and the populous provinces of Banten and West Java. The outbreak is "likely due to some people refusing immunization which causes their children's antibodies and resistance to be low," Health Minister Nila Moeloek said after visiting a hospital where more than more than 30 diphtheria patients were being treated. She said there could be a variety of reasons why increased numbers of parents are refusing immunizations. The disease disappeared during the three-decade rule of Indonesian dictator Suharto when a family education program sent volunteers such as the wives of government officials into villages where they talked to mothers about nutrition and sanitation and reminded them about national immunization days. The program was abandoned after Suharto's ouster in 1998, and a subsequent decentralization of government in Indonesia has complicated the work of health officials. Rumors that vaccinations are dangerous and violate Islamic law have also gained currency in the world's most populous Muslim nation. The result, according to Elizabeth Jane Soepardi, who oversees immunization policy at the Ministry of Health, is that immunization rates dropped in some communities. "I didn't even know about immunization," said Satiyah, a 46-year-old mother of three whose adult son is being treated in an isolation ward for diphtheria after developing fever and nausea. "None of my children has been immunized since birth," said Satiyah, who goes by one name. She said now that she risks losing her son she will allow her 15-year-old daughter to be immunized.